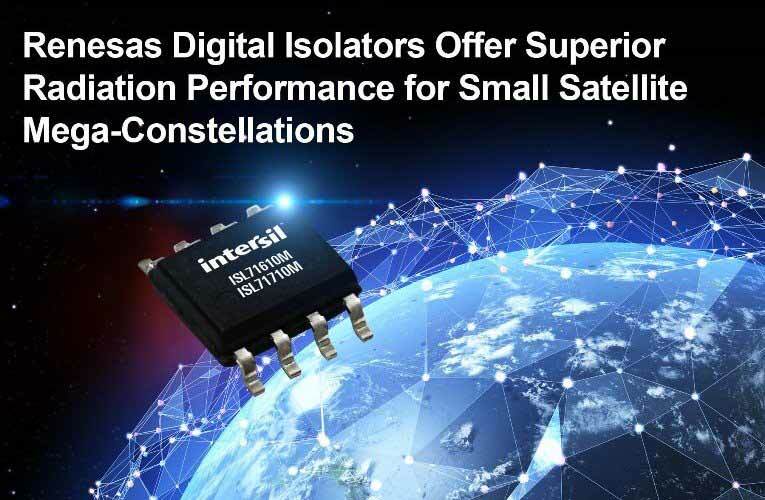 Renesas Electronics, today introduced two new digital isolator ICs namely the ISL71610M and the ISL7170M. These plastic packaged, radiation-tolerant digital isolators provide high isolation protection upto 2,500VRMS­ for power supply and serial communication interface circuits used in Low Earth Orbit (LEO) Small Satellites (SmallSats). In isolation partitioned power supply designs, the ISL71610M and ISL71710M provide an instantaneous 2.5kVRMS of isolation and 600VRMS continuous working voltage at 85°C. Both meet the New Space industry’s highest data rates which make them ideal for serial communications links, such as RS-422, RS-485, and Controller Area Network (CAN). The ISL71610M digital isolator is used in the Isolated 100V Half-Bridge Power Supply design, which can convert the 100V input voltage from satellite solar panel to system level voltages like 28V, 12V, 5V 3.3V etc with an efficiency of 94%. The ISL7170M isolator IC is used in CAN bus application to provide fault proof serial communication between the CAN Bus controller and the CAN transceiver. Both the ISL71610M and the ISL7170M IC are available in the 8-pin SOIC package with a footprint of 5mm × 4mm. The ISL71610M and ISL7170M are priced at $61.53 and $64.18 USD respectively for a quantity of 1000 units. You can visit their website for samples and more information.